EVGA introduces you to the ultimate in raw performance for the next gen Intel® Extreme lineup: The EVGA X299 Dark. The Dark is crafted from the ground up to be the performance apex with everything you need to make a record-breaking benching run or a 24/7 number cruncher, and nothing you don't - a board that is as reliable as it is fast. 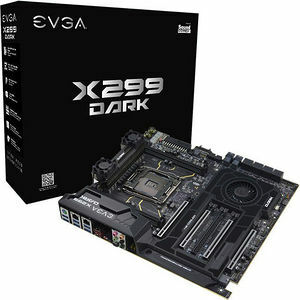 The EVGA X299 Dark has all of the current gen top-tier component support, multiple M.2 slots, Intel® Optane™ support, multiple U.2 ports, up to 64GB of 4000MHz+ (OC) Quad-Channel RAM on a Skylake-X or up to 32GB of 4133MHz+ (OC) Dual-Channel RAM, dual Intel® GbE LAN, USB 3.1, and a full-featured GUI UEFI/BIOS. There is much to be said about a beautifully-engineered motherboard designed to handle the highest loads or the most extreme conditions, let alone the rigors and abuse constantly demanded by the best overclockers in the world, and still look good doing it. This was achieved, in part, by using a 12-layer PCB, a 16-phase Digital VRM (12 VCore, 1 VSA, 1 VCCIO, 2 Phase Memory PWM), 100% solid state capacitors, a CPU socket with 300% higher gold content, and an external BCLK. The X299 Dark proves once again that until you have used it, you don't know the power of the Dark side of the EVGA motherboard lineup.